This event was organised in conjunction with the World Junior Pairs every two years from 1995 to 2003 and the last edition was held 2006 in Piestany, Slovakia, when the WBF decided to leave the Zonal Conferences and the NBOs to organise their own events. A Bridge Camp is a gathering of young people who wish to spend some time full of bridge, other activities and fun – while making new international friends and strengthening old relationships. The WBF Youth Committee was proud to announce that the 7th World Junior Camp took place in one of the WBF’s newest member-countries: Slovakia. The Committee was grateful to the European Bridge League and the Slovak Bridge Association for providing an excellent venue in a very convenient location, and appreciated their cooperation and the warmth of their hospitality. THIRTY YEARS have passed since Junior Bridge Camps were introduced in Europe – eleven since they were adopted by the WBF – and their contribution to the development of the game among young people has been significant. Camps do not mainly address the champion players but the lesser mortals; they aim at helping young people make new friends, and strengthen ties already developed between older friends, under the umbrella of their common hobby. In the Camps there are very few rules, but many possibilities open to those who wish to take them. Many great players, including some of today’s World Champions, started their careers as shy participants at the European Camps where experience has shown that whoever joined once, came back again and again. 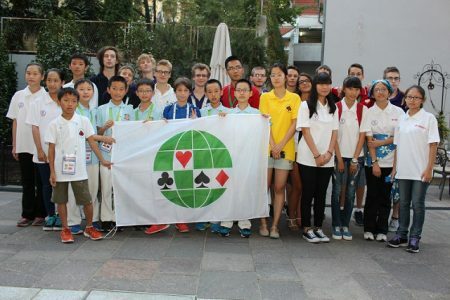 The 6th World Youth Bridge Camp was a great success. With 94 participants from 17 countries and 4 WBF geographical zones, it became the best attended such event ever held in North America. The Juniors enjoyed a programme full of tournaments, bridge lectures, physical sports, outings, etc. Naturally, there was plenty of free time for unofficial games too, and indeed many were organized here and there. In addition, participants enjoyed meeting a number of top players who visited the Camp and showed their support for Junior bridge. The 6th World Junior Camp was the first official world camp held in North America. It was also the first World Junior Camp held outside of Europe. This development came as the result of the need to expand Junior bridge all over the globe. Camps are particularly useful in that respect. Holding a Junior Camp in Europe (in conjunction with the World Junior Pairs) and another one in North America (in conjunction with the World Junior Individual) balances the world programme and provides one World Junior Camp every year. It had been nearly a decade already since the introduction of the World Junior Campthe The WBF Youth Committee was proud to announce that the fifth event of the series took place in a wonderful holiday center, in Hungary’s Várgesztes Villapark, 7-14 July 2003. The Venue of the Camp is the wonderful Várgesztes Villapark, a new development situated on the slopes of Vértes mountain, 20 km south of Tata (site of the 2003 World Junior Pairs Championship), some 75 km north-west of Budapest and 200 km south-east of Vienna. The nearest major town is Tatabánya. The daily program includes lectures (for weaker and stronger players) on various bridge subjects to be given by acknowledged teachers. Certain hours is devoted to physical sports. 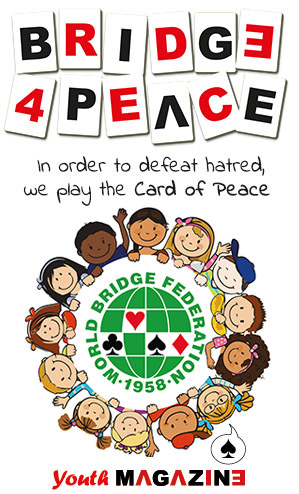 In the numerous bridge tournaments, the mixing-up of nationalities is systematically encouraged. There is at least one organized outing to places of interest nearby. Naturally, participants have plenty of free time to spend as they wish within the framework of the Camp. It had been six years already since the introduction of the World Junior Camp. The WBF Youth Committee was proud to announce that the fourth event of the series took place in a wonderful holiday center, by a lake, in Poland’s Insko National Park, 9-16 July 2001. 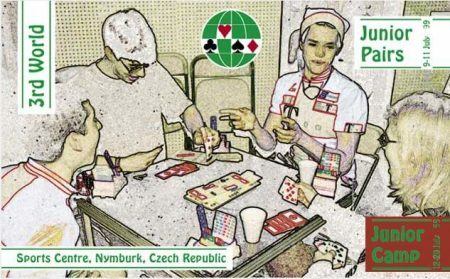 The 3rd World Junior Bridge Camp will be held in Nymburk, Czech Republic, 12-20 July 1999. The successful launch of the World Junior Camp in Ghent ‘95 and its sequel Sportilia ‘97, set the ground for the establishment of a most important event. Accordingly, the WBF Youth Committee is proud to announce that the 3rd World Junior Bridge Camp will take place in Nymburk Sports Centre, Nymburk, Czech Republic, 12-20 July 1999. 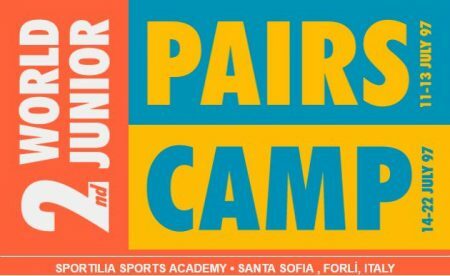 The 2nd World Junior Bridge Camp took place in Sportilia Sports Academy, Santa Sofia, Forlí, Italy, 14-22 July 1997. Junior Bridge Camps have existed in Europe for over 20 years now, and played a very important role in the development of the game among young people. Camps do not mainly address the champion players but the lesser mortals; they aim at helping young people make new friends, and strengthen ties already developed between older friends, under the umbrella of their common hobby. In the Camps there are very few rules, but many possibilities open to those who wish to take them. Many great players, including some of today’s World Champions, started their careers as shy participants at the European Camps where the rule has been that whoever joined once, came back again and again.